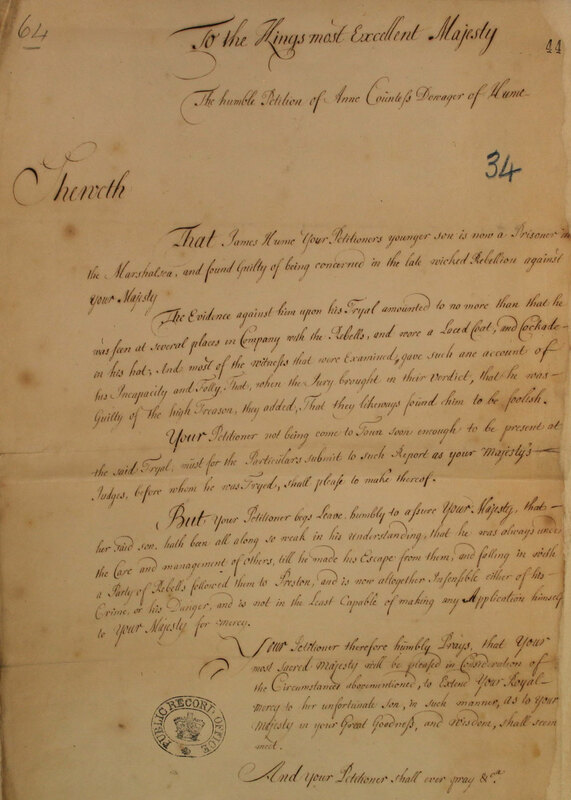 Petition from Countess Dowager of Hume to King George I for the pardon of her younger son, 1716. Lady Hume says she was unable to attend the trial of her son for his supposed involvement in the 1715 Jacobite Rebellion in Preston, Lancashire. She wants to plead for mercy on his behalf and argues that he is not responsible for his own actions and has limited understanding. (SP 35/7 f.34). [prison on the south bank of The Thames in Southwark] and found Guilty of being concerned in the late wicked Rebellion against Your Majesty. The Evidence against him upon his Tryal amounted to no more than that he was seen at several places in Company with the Rebells, and wore a Laced Coat, and Cockade [white ribbon rosette to show support for the Jacobite cause] in his hat; And most of the witness that were Examined, gave such an account of his Incapacity and Folly, That, when the Jury brought in their Verdict, that he was Guilty of High Treason, they added, That they likeways found him to be foolish. Your Petitioner not being come to Town soon enough to be present at the said Tryal, must for the Particulars submit to such Report as your Majesty’s Judges before whom he was Tryed, shall please make thereof. But your Petitioner begs leave humbly to assure Your Majesty, that her said son, hath been all along so weak in his understanding, that he was always under the care and management of others, till he made his Escape from them, and falling in with a Party of Rebells followed them to Preston, and is more altogether Insensible either of his Crime or his Danger, and is not in the Least Capable of making any Application himself to Your Majesty for mercy. Your Petitioner therefore humbly Prays, that Your most sacred Majesty will be pleased in Consideration of the Circumstances above mentioned, to Extend Your Royal mercy to her unfortunate son, in such manner, As to Your Majesty in your Great Goodness, and Wisdom, shall seem meet.